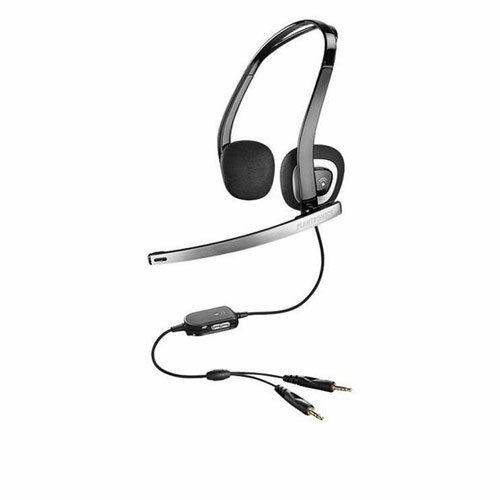 Plantronics .Audio 330 Computer Headset - Headsets Direct, Inc.
.Audio 330 Computer Headset has been discontinued. Live the intensity of the multimedia lifestyle through full stereo richness and crystal-clear voice accuracy. The .Audio? 330 is designed for the full range of media including music, gaming, DVDs, Internet talk, sound recording, and voice applications. A noise-canceling microphone enhances speech recognition, while the QuickAdjust? telescoping, pivoting boom assures ideal microphone placement. The lightweight design, flexible headband, and soft, swivel-mounted ear cushions let you work and play in plush all-day comfort. Convenient inline volume and mute give you full control over your listening and speaking experience. The .Audio 330 is compatible with popular PC sound cards for plug-and-play ease.